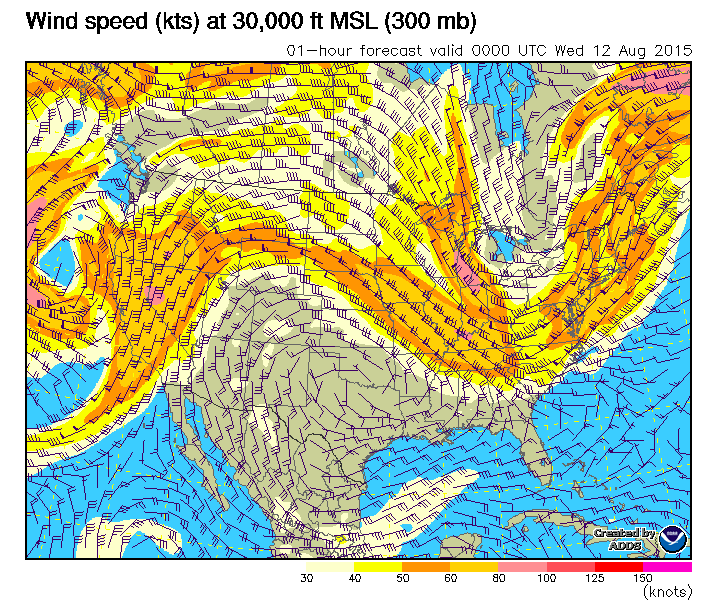 The ADDS Wind plot will display forecast winds at 3000 foot intervals below FL 180 and 6000 foot intervals above. The forecast time can be selected anywhere from 1 hour to 30 hours into the future. Because you can simply trigger the scroll arrows in the altitude field, you can literally step the plot up or down at will, which allows you to build a better picture in your mind of the winds in the vertical dimension as well as the geographic map. The same plot can be converted to a temperature aloft plot, allowing you to evaluate the upper air temperatures and get an idea what the relationship to ISA will be. Since you have already looked at the upper atmosphere through Earthwinds, this will hopefully not reveal any surprises; rather, it simply confirms the picture you already have.